This is the first stage of the Saturn IB rocket on display in the rocket garden at the Visitor Center at the Kennedy Space Center near Titusville, Florida. This photo was taken around midnight while at the visitor center on the evening of the first launch attempt for shuttle mission STS-130. This rocket was given vehicle number SA-209. It was stacked and launch ready as the rescue flight for Skylab 4. It was later the launch vehicle for a planned Skylab 5 mission to reboost the Skylab space station. When that mission was canceled, this rocket became surplus. It was put on outdoor display at the Kennedy Space Center. 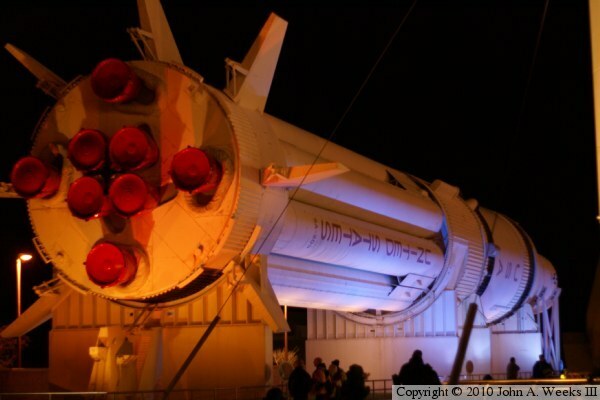 The rocket motors deteriorated badly and were replaced with replicas in the early 1990s.